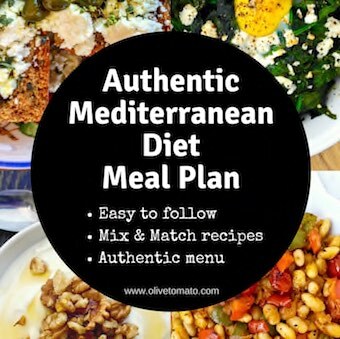 Beans are an important part of the Mediterranean diet. They were cheap and they were vegan, which was necessary as Greeks fasted from animal products for over 200 days a year. But they are so much more! They are delicious and so versatile. They are a perfect nutritional package: plant protein + fiber + antioxidants + carbohydrates. And chickpeas are no exception. Because of all these components, they are filling, they help control our blood sugar so we stay full longer, they can protect from heart disease, diabetes, cancer and they help with weight loss. 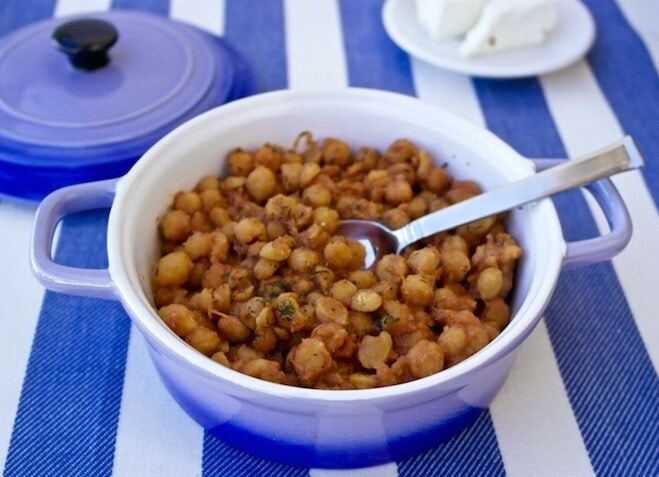 Greeks generally eat beans in the form of a stew, combined with greens or pureed as in the fava. But I love all these other great recipes that appear all over the world: in curries, chili, patties, even in desserts. You really cannot go wrong with beans, also known as pulses or legumes. The United Nations declared 2016 the International Year of Pulses, basically to heighten public awareness of the nutritional benefits of beans as part of sustainable food production aimed towards food security and nutrition. Did you know that pulses are plants that have nitrogen-fixing properties which can contribute to increasing soil fertility and have a positive impact on the environment? So they are good for us, but also good for the planet. Now this recipe combines boiling in the beginning (to get them soft) and then roasting to thicken them and bring out the flavors. The result is a satisfying, flavorful bean dish, which of course goes great with feta. If you use canned, than you can go straight to the roasting part, but make sure to sauté the onion and garlic before roasting them. 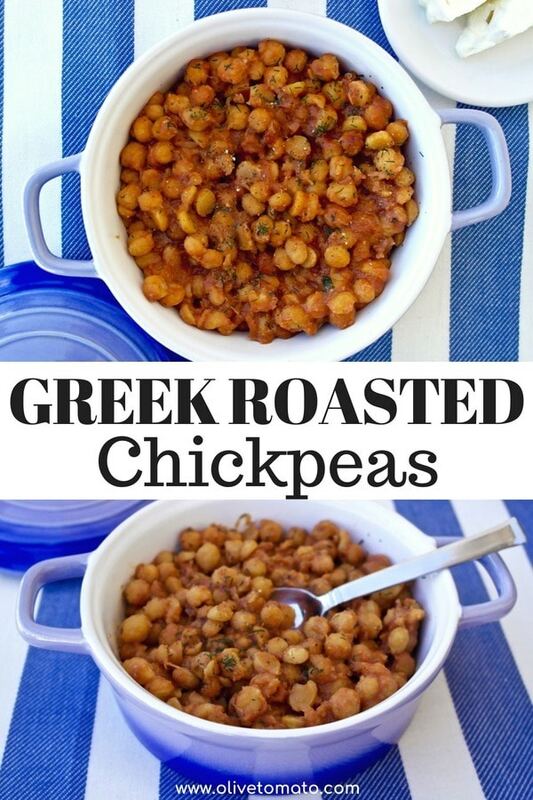 I also used peeled dry chickpeas, but you can used unpeeled. And don’t forget to soak the beans the night before. 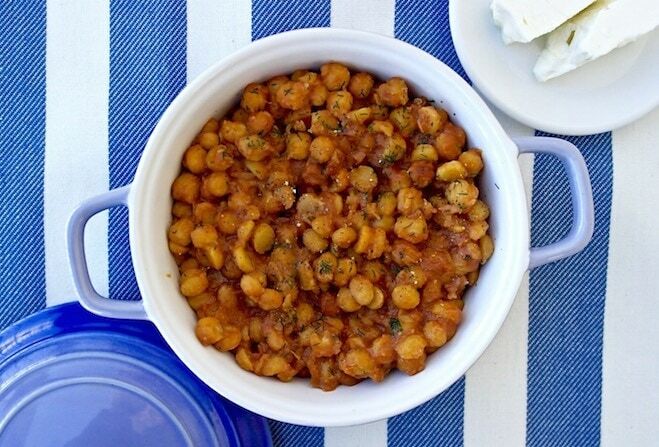 If you are looking for a stovetop recipe for chickpeas, check this one out. Rinse and place in a pot with the onion, garlic and bay leaf. Add water until it covers beans with about an inch of water above the beans. Simmer for about 45 minutes (it may take longer) until chickpeas are almost completely cooked and water is all absorbed. Preheat oven at 350 degrees F (180 degrees C). Stir in the tomato paste and let it heat, stirring gently so that it spreads over all the chickpeas. Remove from pot, empty the beans in a casserole dish and add 2 tablespoons olive oil and the dill. Blend well. 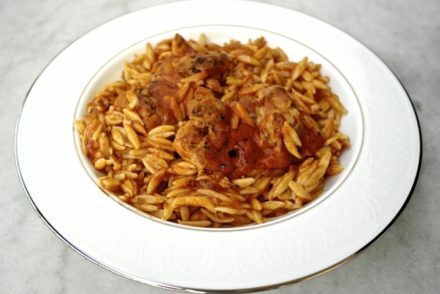 Add about ½ cup warm water at the corner of the casserole dish and tilt so it spreads over the base of the whole dish. Cover the pan with aluminum foil or with its lid. Can I use fresh tomtatos instead of paste? Or wil it be too liquidy? You could add the tomatoes a bit earlier while the beans are simmering, so that should get rid of some of the liquid, and then you would less than 1/2 cup of the water when you put them in the oven. Never liked dill, is there a substitute herb you could suggest? I was thinking basil or parsley… Other than that, I will be making this soon! Parsley would be you a good choice. I prepared this this morning, so I could have it at lunch with a salad. You are so right about the dill being essential and not at all overpowering. Delicious. I made this and brought some to work for others. They loved it as much as I did. Will be making this soon again. We were in Greece on holiday 2 weeks ago. I’ve just made this for lunch and not only was it delicious but the dill and tomato combination took me back to Greece. I have 2 remaining portions in the freezer for a taste of sunshine at work. Pre peeled, dried chickpeas?? Did not know that existed, do you recommend a brand? 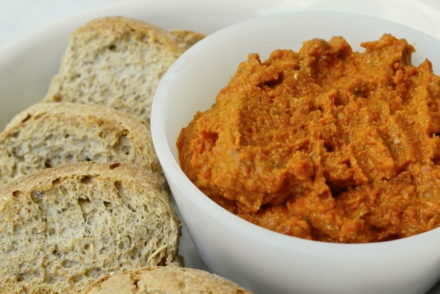 Hi Elena … I love chickpeas and was wondering if I had this as a main what would I have with it? … a small or large greek salad? Bread with olive oil? I’m still not sure of combinations to make sure this way of eating for my health works. I would really appreciate the advice … thanks. Hi Mary, Typically in the Greek diet a main dish of beans is consumed with some feta cheese and a bit of bread. It is a complete meal on it’s own as beans are a great source of fiber, carbs and protein. Hi Elena … do I then have a large or small greek salad for dinner? 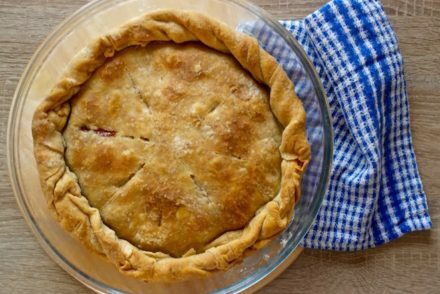 It would be really great to have some examples of combinations using some of the recipes you have given us. I really want to get this right. Thanks again. Thank you so much Elena … so grateful for your time … all the best.